Author : Helen Kendrick with Campbeltown Community Business Ltd. Produced in association with Campbeltown Community Business Ltd, at first glance you might not recognise this as one of our books! The Picture House opened in 1913 and is a quirky A-listed building by a hitherto little-known cinema architect Albert Victor Gardner. The cinema has recently been restored and is now a working cinema again, run as a community business. 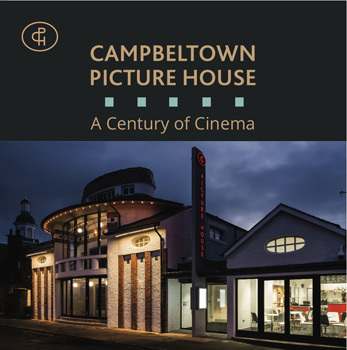 The book is vibrant and colourful and a celebration of the survival of the Picture House which looks more like a ship or a spaceship than a cinema! There is a foreword by one time mobile cinema projectionist, Michael Russell MSP and a poem by Liz Lochhead, Sctos Makar. The book includes contributions from the community and those involved in the building restoration, oral history snippets from past customers and staff and an examination of the early history of the building by art nouveau expert Helen Kendrick, author of Glasgow Interiors.